Here comes the peppy and soulful track, Bachche Ki Jaan Loge Kya from forthcoming comic caper #102NotOut, featuring #AmitabhBachchan and #RishiKapoor. The maker of the film is out with soulful and fun track Bachche Ki Jaan Loge Kya from Umesh Shukla directorial 102 Not Out, which portrays the relationship between the 102-year-old father and his 75-year-old son on the silver screen. The song is crooned by Arijit Singh and this happy fun peppy number is composed by Salim-Sulaiman and written by Hiral Brahmbhatt. 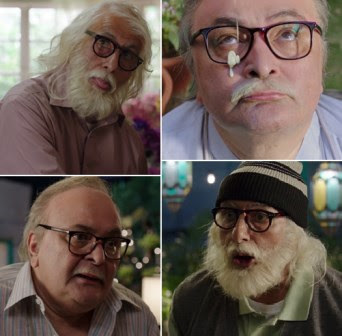 “102 Not Out” is an ageless comedy that brings together Indian Cinema’s two biggest stalwarts-Amitabh Bachchan and Rishi Kapoor after 27 years, with the two legends playing father-son duo for the first time. 102 years young Dattatraya Vakharia (Amitabh Bachchan) lives life to the fullest and wants to break the record of oldest living man- that’s held by a 118 years old Chinese. Dattatraya wants to live a stress-free life in order to become the oldest living man. However, there is only one hindrance- his 75-year-old son Babulal (Rishi Kapoor) who has resigned himself to a life of old age stuck in drudgery. It is produced by Sony Pictures Entertainment Films India, Treetop Entertainment, and Shukla’s Benchmark Pictures. The film is slated to release worldwide on May 4.